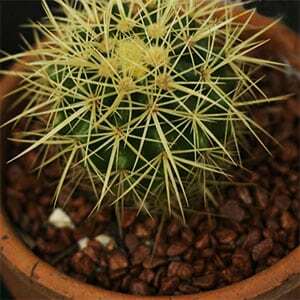 If you are looking for an easy care feature plant, then the Golden Barrel Cactus (Echinocactus grusonii) is one to consider. With a very attractive rounded barrel shape, it is at home when grown in a container, and can also be grown in a rock garden or succulent garden. It is the rounded shape and the patterns created by the spines that give this plant impact. It can be grown as a solitary feature plant, or planted in a group of 3 or more. Although the cactus itself is the main feature, it also flowers, small golden yellow flowers form a crown on the plant, usually in summer. Flowering will be best when the plant receives good sun. A well drained soil and good sun are essential for the plant tp be at its best. Ensure that winter drainage is good to prevent root problems. 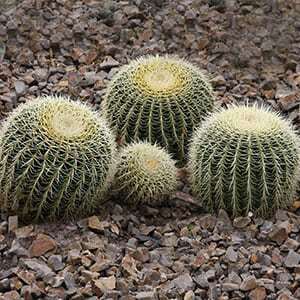 This can be achieved by racing the garden bed, or planting the cactus in a sloping section of the garden. Additional watering will rarely be required, in very dry summers, water by soaking the soil, not watering the foliage or barrel itself. In summer, watering every second week is usually sufficient. In winter, no water is usually required. The plant itself is not toxic to cats and dogs, the spines however can be painful and cause infection. Easy from seed, however slow to germinate and grow. You can collect seeds after flowering and seperate them from the pods. Seeds are surface sown on a mixture of seed raining mix, course sand or grit and vermiculate. Foliage – Green body bribed with pale yellow to cream spines.